Final Fight game for PC is the best ever game with great grphics and sounds. The game can be played in single and two player modes. When i saw the picture of this game i remembered how much i played this game in Video Game shop. Its a lot of time now but the game has the attraction to be played till now. 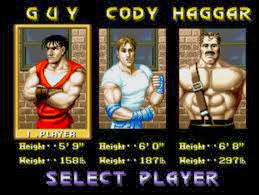 There are three characters Guy, Cody, haggar in the game. Guy with red, cody with white shirt and haggar with naked muscular body man fight to end up the crime and criminals in the city. During their mission they pass accross many criminal and different areas. At the end of each mission there is a big giant shaped enemy to be killed for going to next level. The main theme of the game is to rescue the daughter of the Mayer Jessica who was kiddnaped by the criminals. There are total six stages in the pc game final fight through which one must successfully come out in order to get the location of Jessica and to rescue her. 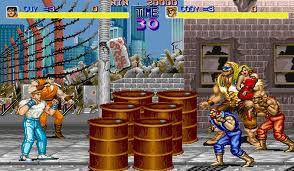 The stages of the game final fight are Slums the Subway, The Westside District, The Industrial Area, The Bay Area and Uptown Metro City.